Lawn & garden, and some nature too. I have a love-hate relationship with lawns. My toes like to curl deep in a green sponge of the stuff, but there’s a snake lurking in the grass. Lawns became popular in northern Europe during the Middle Ages. So did witch-burning and blood-letting. The kind of lawn most people envy today require several supplements, typically in the form of chemicals. The suffix -cide is added to words to indicate “killing,” or “to kill”, while the suffix -izer is added to indicate “render,” or “to render.” The words fungicide, herbicide, pesticide and fertilizer suggest we are killing everything off but the grass, and then trying to render it fertile. It may be time for a change, eh? Most of us see the yard as an extension of our house. We ogle pictures of carpet-like green expanses, and click on pictures of outdoor seating areas free of pollen, seeds, bird poop and rain. The truth is, our yard is part of nature. The reason we need all those chemicals is because we are forcing it to be something it was never meant to be. The out of doors, left to its own devices is biodiverse. The formal lawn is a monoculture. Mono. As in one plant. Grass. There are very few examples of monoculture in nature. Most are purely manmade, such as in agriculture. But your lawn isn’t even being grown for food. You might as well pour concrete on the whole thing and paint it green. The weeds in my yard are a symbol of life. They are nature trying to regain balance. The weeds import biodiversity. In the early morning I pad out to the yard in my pajamas, frequently barefoot. I’m foraging for my grand-rabbit’s breakfast. I acquired the domestic rabbit when my daughter rescued it from her uncle’s farm. Little more than a baby, someone had apparently set it “free” when they decided they no longer wanted it. She is a full-grown rabbit now, and quite at home living in my kitchen. However, lest anyone (my daughter) forget this is not a pet I chose, but one that was bestowed upon me, I will forever refer to her as my grand-rabbit. Her given name is Mandi, but I call her Rabbit and occasionally just Bun. But I digress . . .
On my way in, I will often stop by the salad garden to pick the greens for my own lunch . 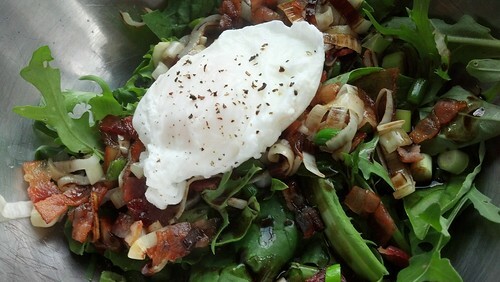 Better yet, I might make a breakfast salad with green onions, crumbled bacon, homemade croutons, and a poached egg on top. Drizzled with a maple vinaigrette, it is the best way to jump-start a five-star day! 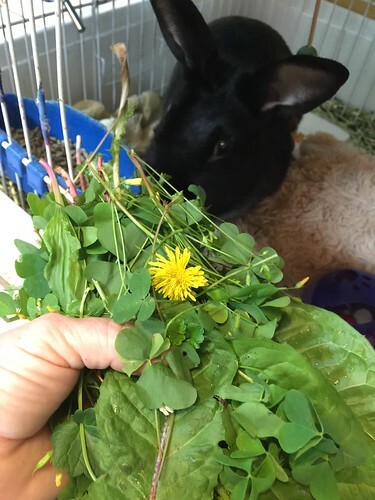 On one particular morning this last week, I was adding dandelion blossoms to Bun’s breakfast. She gobbles them up like candy. I left two of them intact, as they each hosted about three tiny bees, bobbing their abdomen atop the yellow flowers. It reminded me that I share this yard — gladly, too. Bun dines on the leaves and flowers of dandelion, clover, plantain, and creeping charlie. Yes, I have creeping charlie. Sounding more like a security issue than a weed, creeping charlie is the scourge of the lawn. It can choke out small plants, and as its name implies, creeps sure-footedly across expanses of ground. My research revealed that it was once touted as a hearty ground cover. Medicinally, it’s been used to cure everything from sciatica to asthma. After is was brought to America, it was found to be very high in Vitamin C, and is now naturalized in almost every region. Please note that not any of these are reasons to purposely plant the stuff, but if you just can’t shake that nasty case of scurvy, you may want to steep a cup of tea. Well . . . you know I had to try it. 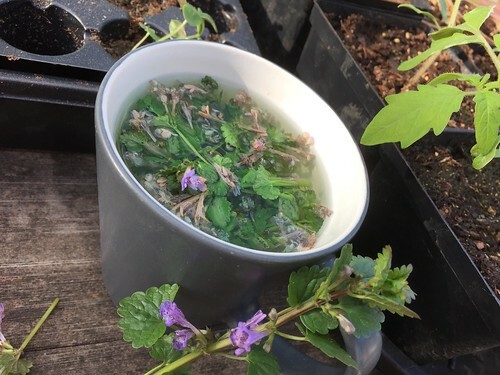 Several writings described creeping charlie tea as severely bitter. I found it fairly pleasant, and not as bitter as some of the herbal teas in my cupboard. *Maybe I just didn’t do it right. I put it in a cup before adding boiling water, as one blog explained. At any rate, I didn’t add the honey and lemon they all insisted I would need. My point being that like people, most plants are not all bad. Even the mint, chives and oregano I planted need to be carefully watched so as to to take over the garden. And grass is not a bad thing, as long as we plant it responsibly where it can grow without added chemicals — or water! I can’t believe anyone is still using water on their grass. The latest recommendation is that if possible, try to find a three to four foot stretch at the edge of your property that you can let go. Let the branches fall and become home for worms. Let the leaves drop and mulch the earth. Let the weeds grow and the seeds germinate. Let the pollinators buzz and the butterflies sip. Let the squirrels dig. Let the spiders spin. 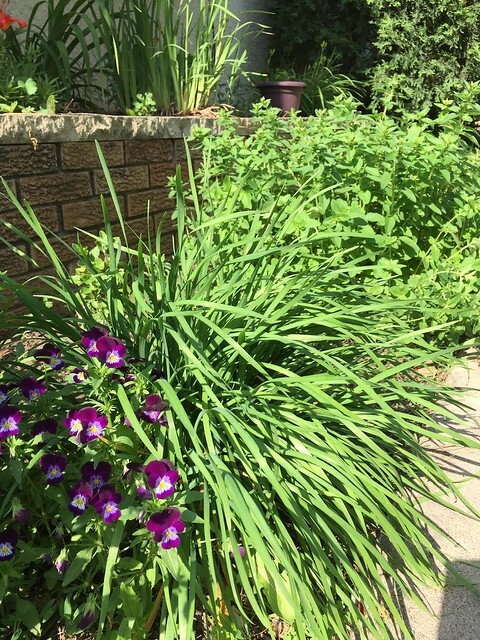 Between the strip and your lawn, plant a transition of native plants and a deep mulch bed. 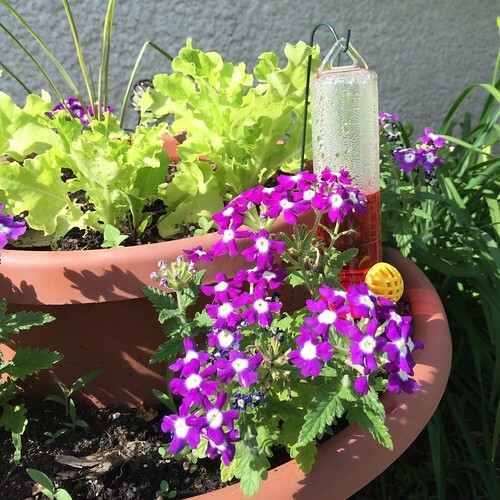 The benefit is less watering, less mowing, and your own little nature preserve right at home. *There are all kinds of reasons I wouldn’t suggest you try this on my suggestion. You would want to make sure you were indeed using the right herb. You would want to wait after a first sip to make sure there is no reaction. You want to know there are no toxins on anything you consume. And you might want to make sure you have someone who can dial for emergency if necessary. Please do your own research. I am NO expert on the subject! I feel like I owe you an explanation. Several, actually. I’ve been busy. But more than that, I seem to have lost my voice. Or maybe I’ve lost my train of thought, sprawled recklessly off its track with weeds growing up through the axles. What started me blogging was a perverse lack of passion for anything at all. An apathy for life itself. Blogging became my antidepressant. And like an antidepressant, as it heals, seems less needed. The patient forgets to take the dose, or self-prescribes a weaning-off. My work, the work they pay me to do, requires more thought than my old position; more creative thinking. Unfortunately, leaving me with less available to me in my leisure. So instead I create with my hands. Remember my hugelkulter? As promised, I am sharing its progress. 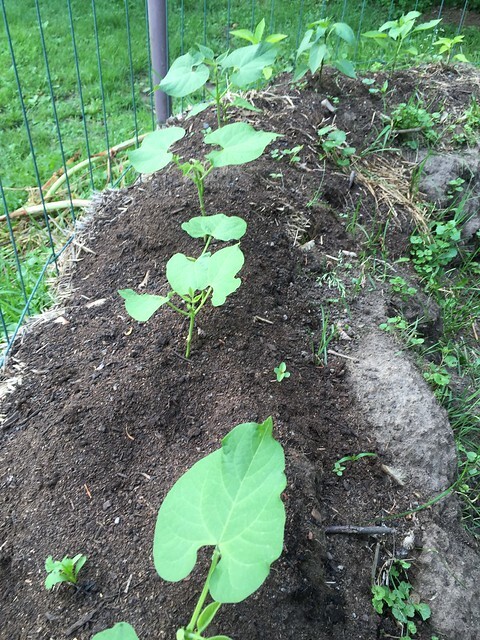 I’ve now planted in it — bush beans and cilantro and pepper plants . 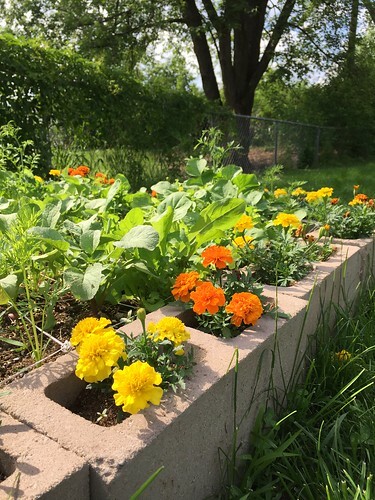 . .
A Salad garden was built and is already being harvested . . . The rain garden has been dug out and native plantings are going in . . .
A path was laid . . .
A stepping stone was made . . . The lawn is being taken over one small planting at a time. Iris and catmint and clematis along the fence . 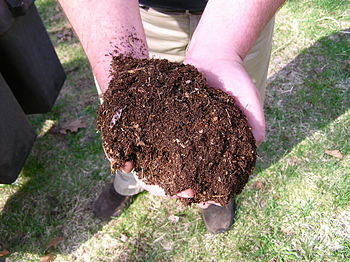 . .
Cardboard, compost and mulch create a no-dig garden, ready for planting this fall or next early spring . . .
Planters and feeders . . .
And plenty of volunteers to help . . . I promise I’ll write soon. I know what I want to say, I just can’t put it to words right now. I’m keen on experimenting in the garden. My friend Mary says I’m a horticulturist. I like that thought, but I’m not sure I’d use that word to describe myself. Maybe just a goofy plant lady who gets bored seeding in straight lines. Last fall I planted eight garlic cloves for the first time. In their place, eight tender green shoots reach up through the otherwise neglected soil. There is something about coaxing nature that satisfies me. One year I tested straw bale gardening. If I can find some good bales, I’ll try it again. 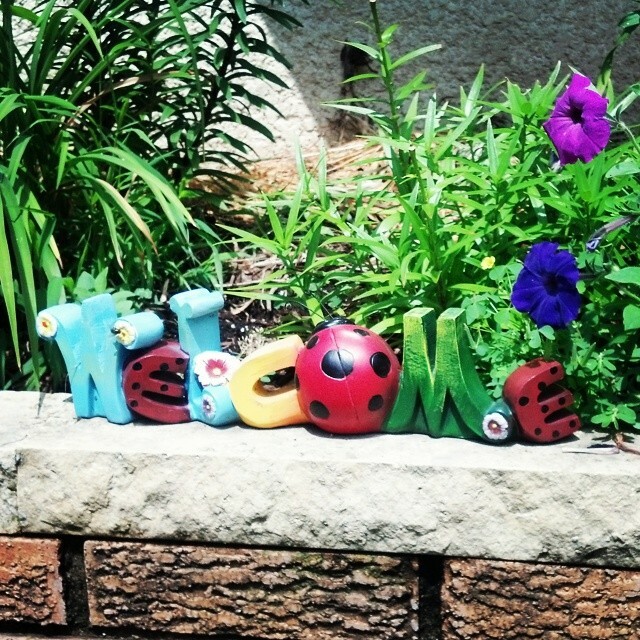 I’d like to give keyhole gardening a shot in the front yard. The one thing I can’t grow is grass, but grass is on the way out anyway. My yard could also use a few rain gardens. I live in the middle of a big hill and there is an underground river that would like to flow right through the middle of my basement. Bubba helped me fix the drainage. 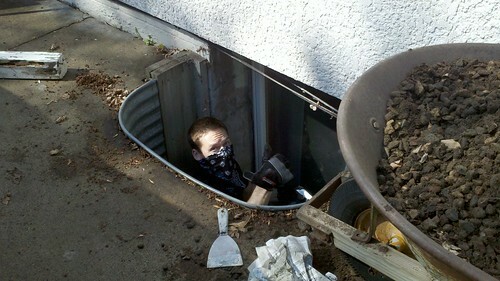 Bubba helped me fix the drainage so we no longer see any water in the house. But here’s the deal. If I and all my neighbors up the hill would do our best to keep our water in our own yard, fewer homes would have drainage issues. The old adage is to divert the water away from the house. 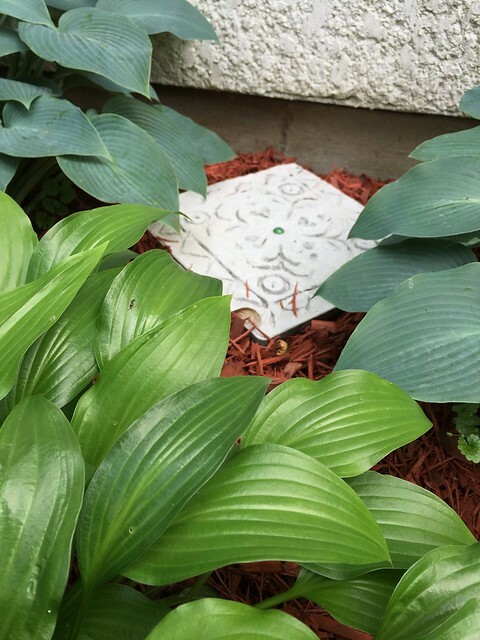 This is sound advice, but to most homeowners this means draining it from the yard and eventually to the street where it flows freely through underground systems to our natural waterways, fertilizer and all. We now know this has harmful effects on both the environment and those of us who live in it. When I moved into my home, it was April. After some unusually long hard rains, I realized I was now the proud owner of lakefront property and a couple of ducks. My first instinct was to dig a little trench on the downhill side of the yard and let it all drain away. That worked great. This was the year of the foreclosure, and the houses on either side of me were vacant. The growing pond below me was a great solution. Then the house uphill from me sold. A builder came in to flip the house. He had no interest in neighborliness, only profit. He used my water hose without asking and parked his trucks in front of my driveway before I had to leave for work. He pointed rain spouts right at my house, and all of the pavement drained my way. A call to the city resolved nothing. After the first good rain, there was a river through my basement, the garage, and the backyard. The little trench I dug out to drain the yard was quickly eroding and becoming a waterfall. What’s more, I now had a neighbor downhill from me too, and I was feeling really guilty about draining into his backyard. But it wasn’t just his yard. Mentally, I mapped the route the water on my property had taken. Twenty houses uphill were all emptying their run-off downhill. Once it hit my yard, it went on to reach other basements, garages, the sewer and eventually our waterways. Wishing the uphill properties wouldn’t drain into my yard wasn’t enough. I was a neighbor to those below me. A change had to occur somewhere with someone. And that was when I decided it might as well be me. I stopped using chemical fertilizer and pesticides. What used to embarrass me, is now an emblem of pride. My dandelions feed the pollinators in early spring when other foods are hard to find. I also have a rabbit who loves for me to forage the chemical-free greens for her breakfast. As the gardens take over the lawn, maybe someday I can even get rid of my gas-powered lawn mower. I filled in the drainage trench. Even if it means living lakefront once a year, I want to keep the water that comes into my yard from leaving my yard. If we all thought that way it would be an easier task. And we would be better stewards of our neighborhoods, cities, and the planet. I built a hugelkultur. A hugelwhat? A hugelkultur. There are right and wrong ways to say it. I say it hoogle coolter. That, I believe, is the wrong way, but I’m sticking with it. I suppose there are also right and wrong ways to do it, and things to plant in it the first or succeeding years. 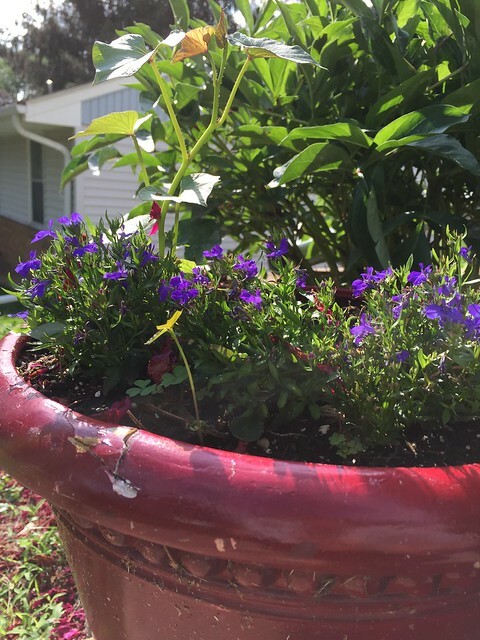 As I am a dubbed horticulturist and stubbornly self-sufficient, I will learn as I go. The word hugelkultur translates to the term hill culture. Typically, a hugelkultur is a raised bed with an inner filling of rotting wood and other composting materials. I highly suggest, if you have more than a bizarre interest in the word hugelkultur, you do your own research, and not use my trial as your reference. 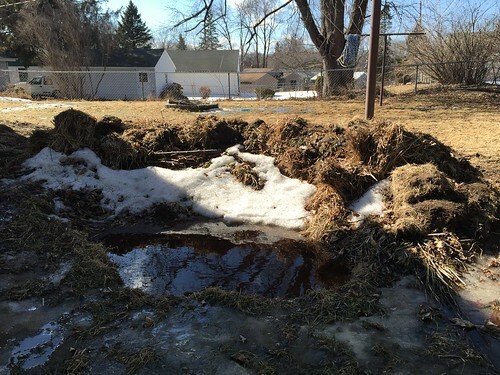 Here, the small impression is retaining some of the spring run-off that would normally run quickly through my yard. 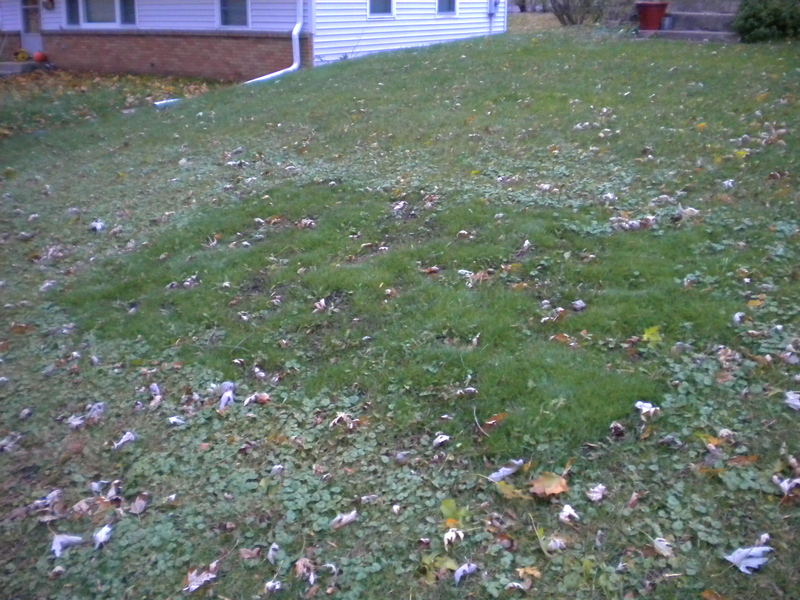 Last fall I scooped out some earth to create an indent that will eventually become a rain garden. The sod and dirt, along with dead wood, was piled on the down side of the indent as a type of dam for heavy rains or spring thaws. The dam doubles as a raised bed with fertile, moisture-retaining compost inside. 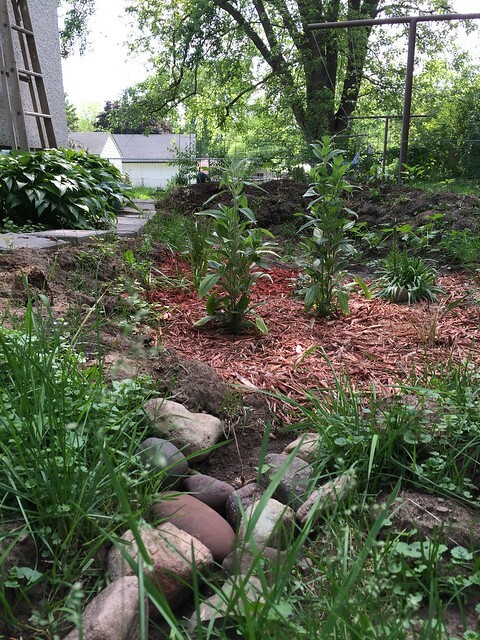 I’ll plant the rain garden this year, making it larger after seeing how well it performed this spring. Once I add soil and prepare the hugelkultur for planting, I’ll share more photos and you can all watch from your armchairs without getting dirt under your nails. The hard part will be keeping the dog off of it. The hugelkultur is in the direct line of Frisbee flight, and you may remember my past challenges with that. We’ve all heard these words of wisdom. Blooms are beautiful, and graceful, and showy. They also smell good. And who doesn’t want to smell good? But the old adage sounds a little to me like, “Shut up and get back to work.” I mean, making the best of things is always a good idea, but there’s nothing wrong with thinking outside the planter. You may be a late bloomer, in full bloom, or just wearing bloomers, but I think we can all agree that blooming is good. A bloom is a plant’s marketing campaign. It’s like walking through Macy’s. You’re only going in for the white sale, when all of a sudden you’re sidetracked by the bright lights and juicy colors of the cosmetic department. Your head turns. Left, then right. The next thing you know you’ve walked headfirst into a woman spritzing you with this year’s version of Miss Dior Eau De Toilette. Suddenly you’re dancing around like a bee on a stamen. Last year I planted some zinnia and sweet alyssum seeds. They came up great. 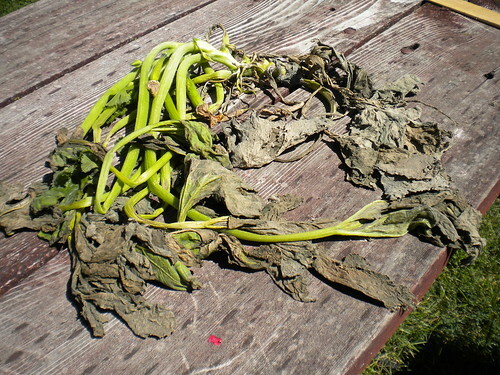 They bloomed where they were planted as expected, and at the end of the summer, I pulled them out and dragged their dead, lifeless carcasses to the compost pile. Their job was done. I gave them water, sunshine and the occasional human-to-plant conversation. I enjoyed their grandeur, and I was grateful. On the way to the compost pile last fall, a few seeds fell off and nestled into the scrappy little spot between our driveway and the neighbor’s. In the spring, they germinated. 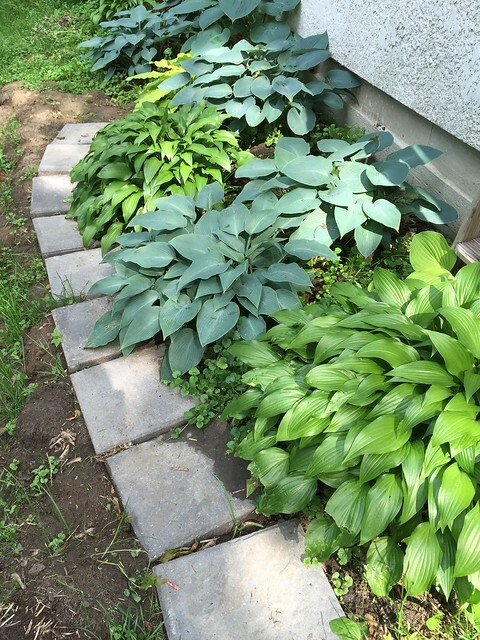 The seedlings were unnoticeable until their height surpassed those of the weeds. 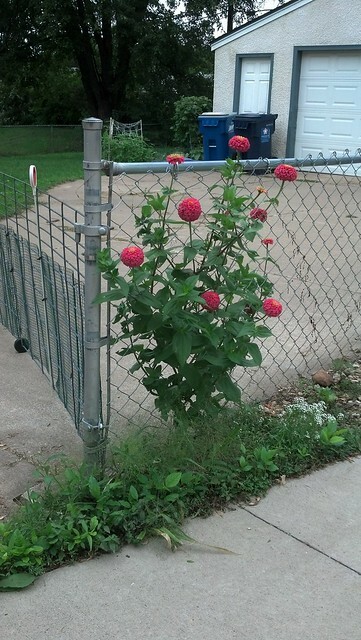 Eventually demanding my attention, I realized they were unmistakably zinnia. It wasn’t until a few weeks later I noticed the smaller, daintier white flowers of the sweet alyssum too. My front garden blooms every year. It greets me on the way in, and rivals the draw of any cosmetic counter for the bees and butterflies. But it was the courageous zinnia with its alyssum companion that made me smile the most this summer. 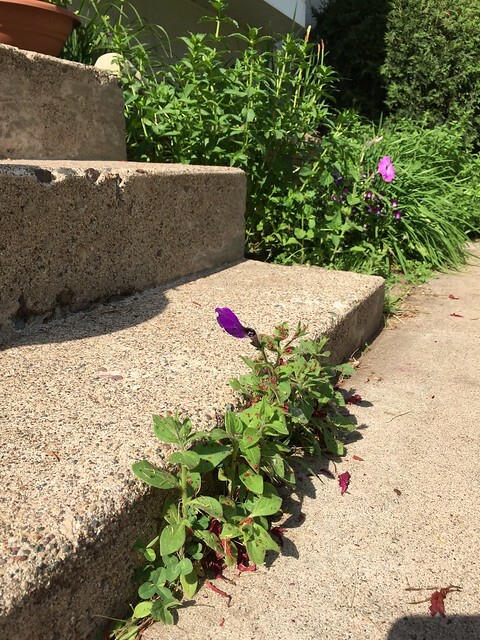 While weeding the cracks, my neighbor called from his backyard deck, “Don’t pull the flower!” I knew they were smiling too. 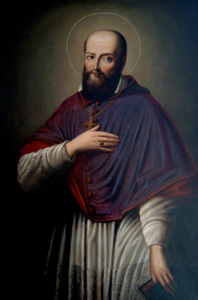 And it made me think about Saint Francis de Sales’ words a lot. I thought about the difference between blooming where you are planted, and finding a place to plant yourself. When you find a place you want to grow, you’re no less beautiful, and you smell just as good — provided you practice personal hygiene, of course — but it might take a little longer to get noticed, because people won’t expect to see you where they aren’t looking. But once you rise above the weeds, and they get a chance to know you for who you are, you will make them smile. You will be blooming in a place they didn’t even realize needed a flower, or knew that one could grow. In time, you might even find that they make a regular garden out of it, and you can take pride in knowing that your blossom was the first of many. And maybe . . . just maybe, as one day they haul your body off to the compost, one of your seeds will fall in a crack in some other forgotten space . . .
Or maybe that’s another story. I wish this was a better photo, but the subject fit the theme so well, I couldn’t resist using it. 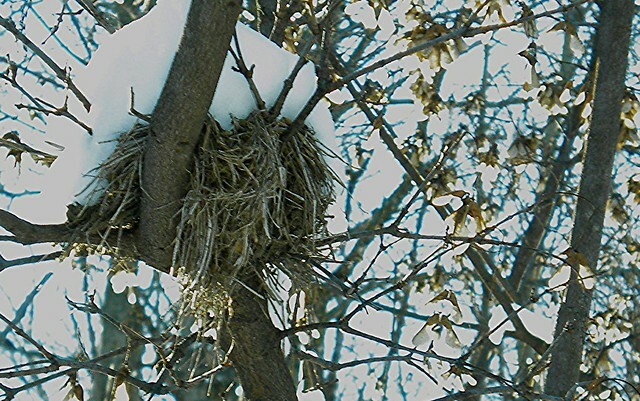 While taking a picture of the sun lighting up the pretty little seeds hanging on this tree, I looked up and saw this birds nest, long since abandoned for a warmer climate. Be part of The Weekly Photo Challenge at The Daily Post. Motorcycle Parking . . .
Water is often is a state of juxtaposition . . . Here is a fun comparison . . .
Juxtaposition often makes us laugh . . .
Is the photographer really focused on the main event? Try to figure this one out before you read the text. Very moving . . . I love the name of this blog. Wish I had thought of it first, but then my name isn’t Rae. I love the photo, and her words. Yes, I did click “follow” . . .
Having parked my car in a lot near our community center, I bundled up against the unusually cold November weather. Initially intending to walk the trail around the pond, I veered off on a side path that leads up to the old Ramsey County Poor Farm. At the top of a series of low rolling hills, the trail opens up at the Ramsey County Cemetery. It is an unremarkable place, easily looked over without the single marble headstone demarcating its existence. The poor farm is the site of our county fair, extension service office, and in October, the farm is converted into a haunted Fright Farm run by the county sheriff’s department. When not in use, it’s the tranquil dwelling of long-lost memories. The walk back to the car was quick. My frozen fingers were beginning to numb. I dropped my camera, which now has a new nick at the corner. I passed a stack of picnic tables, seemingly huddled together against the expectant inclement weather. A bench, once a welcomed respite, now stands lonely and cold. The milkweed remains dry and spent, its fluffy seeds take flight in the harsh November wind. Layers of picnic tables huddled together against the expectant cold winter. Last year at this time, I might have added “I can’t grow grass” to my list of can’ts. 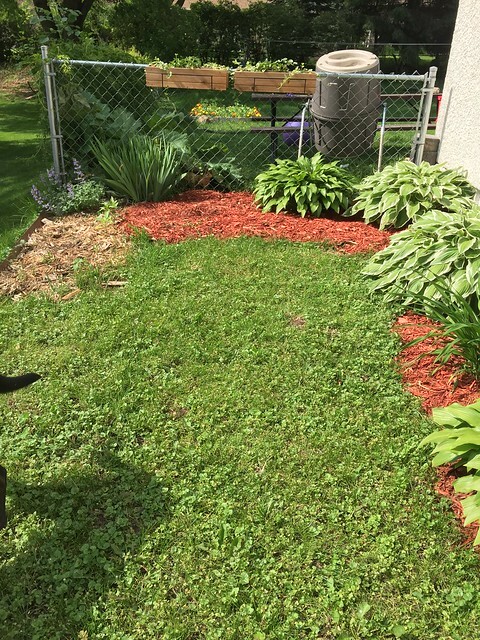 You might have read a post I published way back when I started this blog, In Lawns as in Life, about my trials of lawn ownership. 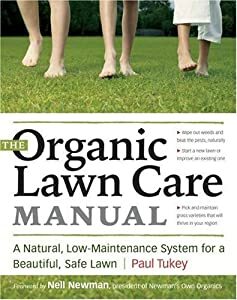 Over this past summer, I read The Organic Lawn Care Manual by Paul Tukey and learned a lot. The previous owner of my home used a lawn service, which is basically junk food for your grass. It keeps it green and looking good, but underneath, it is sick and weak. Once I took it off of that service, it didn’t have anything to fall back on. Even worse, I threw some more chemicals on it without knowing what I was doing. I burnt it out. The soil eroded and the weeds found some awesome hard, lifeless gravel in which to germinate. No matter how much I watered, it was a losing battle. The brown eventually disappeared, but what was left was very weedy. 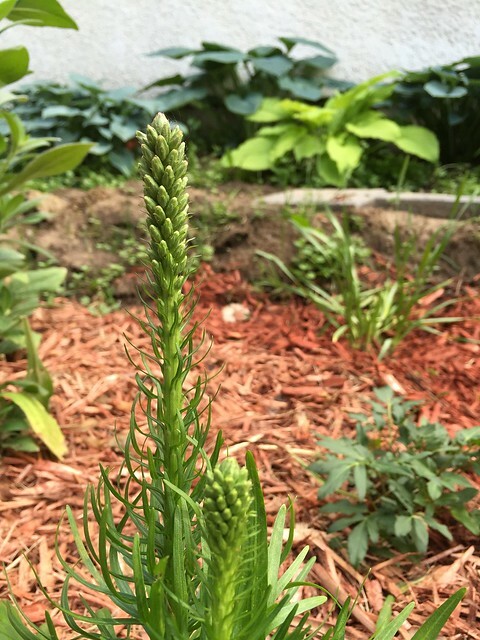 Early last spring, Bubba and I tossed some seed on it, as a start — I had only begun to read the book, and knew I was done throwing chemicals on my lawn. The seed germinated and did thicken what grass was left. I kept reading. 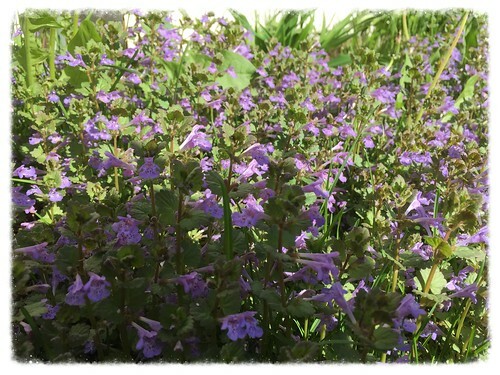 In September , I chose a patch — the worst patch — in the middle of a thriving crop of Creeping Charlie. I took my metal garden rake to break through what soil was there. As the vines of Charlie caught in the tines, I pulled up as much as I could. I know there are still plenty of nodes that have broken off and are waiting to propagate next spring, but the hope is that I am making an environment that is less comfortable for them. compost I had purchased from my garden supply store. Using my rake, I spread them out evenly to the depth of about an inch to and inch and a half. I then spread a nice mixture of seed over the top. By a mixture, I mean that your grass seed has to have a mixture of spreading and clumping type grasses. It makes for a diverse community, which all work together to make a healthy lawn. Of course Paul Tukey states it much better in his book. If I could communicate it as well as he did, I would have written my own book! So read his book if you really want to know what I’m talking about. 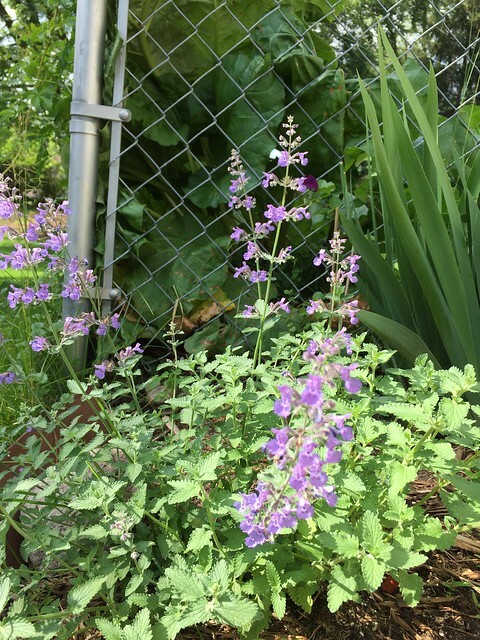 I used my garden rake to incorporate them lightly into the compost and watered religiously — and I’m not a religious person, so that is saying a lot! In a week to ten days, my little grass babies were popping their heads up toward the sun. It was perfect grass weather this fall — wet and cool. Never one to think what I’m doing at the time is of any importance, I am sorry to say that I didn’t take any photos of the process. Now I am here to say that I CAN grow grass. Already I wish that spring was here so that I could check in on my little patch to see how it weathered the winter. The idea is to stop feeding the grass, and to start feeding the soil. There is still raking to be done, and next spring my little patch will receive another dose of compost. I really don’t want a whole yard of grass which requires so much of our good water to be poured out on the lawn. But it is good to know that I can grow grass, and do it without chemicals, in a few places where I would really like it.